Chile is an exciting and exotic South American destination that will delight wine lovers and nature lovers alike with some of the most beautiful scenery on earth and phenomenal wine estates. Santiago, the nation’s capital city is a great starting point and you will find top class restaurants, wine bars and boutique hotels here. Chile’s wine country is primarily located within the perimeters of the Elqui Valley (East of La Serena) and the Malleco Valley (north of Temuco). The wine regions are categorized by valleys and there is a wide range of microclimates and wine styles being made. Heading south from the Elqui valley you will find the Limarí Valley, Choapa Valley, Aconcagua Valley, Maipo Valley, Casablanca Valley, San Antonio Valley, Cachapoal Valley, Colchagua Valley, Curicó Valley, Maule Valley, Itata Valley, Bio Valley, and Malleco Valley. In between wine tastings and great meals in the Winelands you can follow the footsteps of Pablo Neruda in Valparaiso, taste fabulous seafood and enjoy the coast around Viña del Mar, go horse riding or cycling in the vineyards… Great food, wine, culture, and scenery- Chile has it all! 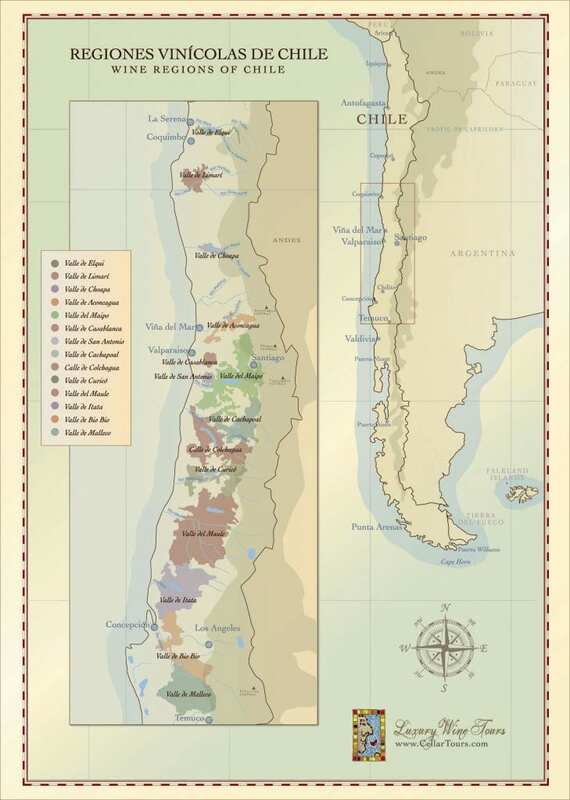 Embed Chilean Wine Regions Map on your site: copy and paste the code below.